But in the midst of these aches and pains and inconveniences, there are moments of goofiness that cannot be fully explained. In the face of ANOTHER uphill climb (what what? The guidebook did not show this! ), Amanda V has introduced the saying, ¡Sí, se puede!, or “Yes, you can!” Tess T today said, “I feel like the storybook The Little Engine that Could!” We used our granny gears (bicycle terminology) and just kept chugging up the hill. Today, for the first time, Alvaro S beat me to our destination! Alvaro has admitted to walking too fast (see previous post), and it turns out he does not like octopus, as do Tess and I. 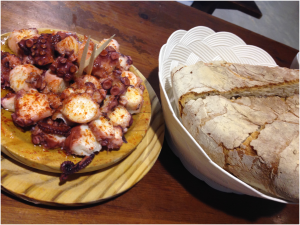 We stopped near the midway point for some amazing pulpo gallego, and Alvaro must have slipped on by at that time! One of the things we have discussed in our classes is that “pilgrimage” means “discomfort”. You cannot make a pilgrimage without feeling sore, uncomfortable, cold, or many other types of physical and emotional discomforts. In its origin, pilgrimage was all about suffering. We are not suffering in major ways, but we are discovering where we might want to recognize that blisters or achy knees or just plain tired legs might be worth saying “I will take the pain for …. “ and that is where we fill in our own individual intentions. We are accumulating a bit of weariness, but the surprising thing, or perhaps what is a testament to the resilient spirit of humanity, we are also finding the moments of ridiculous fun as we walk. This is Galicia, and there are many cows here, vacas in Spanish. Lindsey W has labeled them, instead of the Spanish amigos, or friends, “amoooooo-gos”. In the same vein, today, as a little dog walked Tess and I towards (what seemed would never arrive) our destination, she labeled this dog, (perro, in Spanish), much like a pilgrim (peregrino in Spanish) a perrogrino, or “dog pilgrim”! Errata from previous post: We are feeling sore, but Heidi P is not. She is on the track team at Saint Rose, so she is running circles around us (always providing a laugh when needed too!). Final note: Alvaro made it one day shy of one week before he was compelled to purchase a soccer ball. This is the kid that walks miles and miles, and then takes off his shoes to run a little and kick around a soccer ball. What better Camino could you ask for?